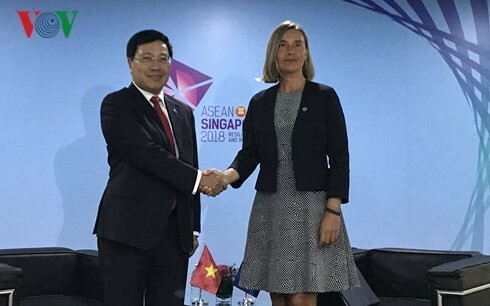 (VOVWORLD) -Deputy Prime Minister and Foreign Minister Pham Binh Minh on Friday had separate meetings with Chinese State Councilor and Foreign Minister Wang Yi and EU High Representative for Foreign Affairs and Security Policy Federica Mogherini on the sidelines of the 51st ASEAN Ministerial Meeting and related meetings in Singapore. Deputy Prime Minister and Foreign Minister Pham Binh Minh and Chinese Foreign Minister Wang Yi at the meeting on August 3rd, 2018, in Singapore. 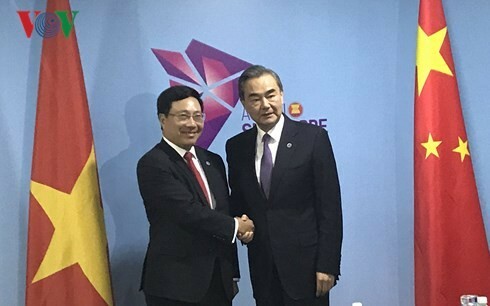 At their meeting, Minh and the Chinese official agreed to continue boosting the comprehensive strategic cooperative partnership between Vietnam and China and pledged their closer coordination in organizing visits of Party and State leaders this year. They consented to work together in realizing agreements and common perspectives reached by senior leaders, continue augmenting cooperation among ministries, sectors and localities. Both sides agreed that Vietnam and China should deal with pending issues in cooperation projects, and maintain the stable and positive development trend of bilateral partnership. Concerning the East Sea issue, Minh underlined the importance of settling the disputes in the East Sea through peaceful measures in line with international law, especially the 1982 United Nations Convention on the Law of the Sea (UNCLOS), as well as the strict implementation of common perspectives of the two countries’ leaders. He also stressed the need to well control the differences, refrain from any action that complicates the situation and escalates disputes, along with the full and effective implementation of the Declaration on the Conduct of Parties in the East Sea (DOC) as well as reaching the effective and binding Code of Conduct in the East Sea (COC) at an early date. Meeting with EU High Representative for Foreign Affairs and Security Policy Federica Mogherini, Minh asked both sides to continue working hand in hand to soon finalize negotiations towards signing a Free Trade Agreement (FTA) and Investment Protection Agreement (IPA). He also urged the European Union (EU) to consider removing the “yellow card” warning on Vietnamese seafood soon, saying Vietnam has been working to deal with illegal, unreported and unregulated fishing. In his meeting with Brunei's Second Minister of Foreign Affairs and Trade, Dato Erywan Pehin Yusof in Singapore on Saturday, both sides expressed their delights at new developments in bilateral friendship and cooperation. They agreed on continued coordination in implementing agreements reached at the 1st meeting of Vietnam-Brunei Joint Commission in February last year, as well as preparing for the 2nd meeting in Brunei next year. They agreed on settling the disputes in the East Sea through peaceful measures in line with international law, especially the 1982 United Nations Convention on the Law of the Sea (UNCLOS), and enhancing cooperation to soon ratify and take into force the Comprehensive and Progressive Agreement for Trans-Pacific Partnership (CPTPP). In another meeting with the Philippine Foreign Secretary Alan Peter Cayetano, both sides agreed that Vietnam and the Philippines shared strategic interests in regional issues, adding that the two countries’ Strategic Partnership has helped enhancing mutual political trust. They pledged to further ties, especially in national defense and security, economics, trade and investment, and cooperation in maritime issues.